They say racing improves the breed, and the smart fortwo definitely needs improvement. Daimler’s city car isn’t really good at anything besides looking cute, and it doesn’t even do that particularly well. 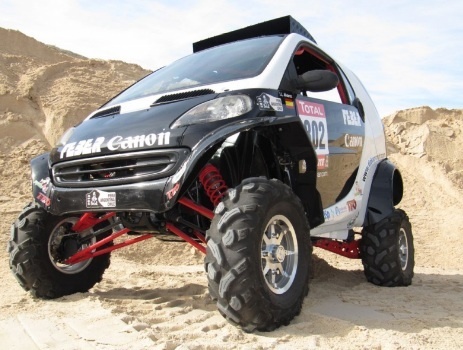 So it seems highly unlikely that a smart would be entered in the world’s most grueling rally, the Dakar. Spanish pilot José Luis Álvarez built such a machine to compete in the 2013 Dakar. Actually, it’s more like an ATV with a smart body. Álvarez started with a first generation fortwo body (sold from 1998 to 2007 in Europe), and placed it atop the chassis from a Polaris XP 900 side-by-side ATV. That gives the fortwo some ground clearance, and makes room for off-road suspension. The fender flares also look like they were taken straight off a racing quad. A Polaris ATV also supplied the Dakar smart’s engine. It’s a 900 cc mill that produces 90 horsepower. It may not seem like much, but it is an improvement over the stock car’s 700 cc engine (the biggest engine offered) which made, at most, 61 hp. A U.S.-spec 2013 smart fortwo passion coupe has a 1.0-liter engine, with 70 hp. The interior also received substantial modifications. It was gutted and fitted with a roll cage, while the driver’s seat was moved to the middle, McLaren F1 style. The result is a “car” that weighs a scant 1,650 pounds. The little smart will up against one of the world’s greatest motorsport challenges. Unlike most rallies, the Dakar (formerly known as the Paris-Dakar) takes place primarily off-road; competitors spend most of the multi-day event traversing uninhabited terrain where vehicles were not meant to go. The Dakar originally took place in Europe and Africa, with Dakar, Senegal as the destination. In 2009, the race moved to South America. The 2013 edition will start in Lima, Peru and finish in Santiago, Chile. Dakar racers come in three general shapes: motorcycles, cars, and trucks. The cars can range from small dune buggies to SUVs like the Mitsubishi Pajero (which has won more Dakar victories than any other nameplate). The trucks are not pickups, but long haul rigs that weigh over 7,000 pounds. Some are used to resupply teams as they go. What’s remarkable about the Dakar is that, unlike most major races, a large portion of the competitors are amateurs or privateers. That’s why a modified smart can make the starting line. 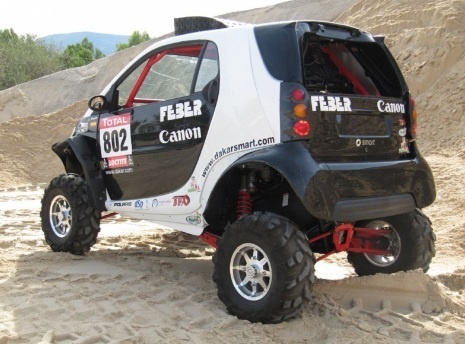 The fortwo will be classified as a lightweight buggy in the 2013 Dakar, which begins January 5.